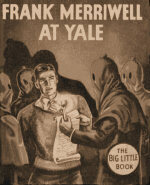 Here we bring you The Adventures of Frank Merriwell, a fictional character that appeared in novels and short stories. The works were penned by Gilbert Patten who wrote under the pseudonym Burt L. Standish. The first Frank Merriwell story was published in 1896 and became popular with readers, especially boys and girls. Frank also appears in radio adventures and comic books based on the novels. He was an all-around athlete, playing football, basketball, baseball and track at Yale while also playing the part of a detective that solved mysteries and righted various wrongs. Merriwell is clean-cut, refusing alcoholic drinks as well as cigarettes and tobacco products. The radio show The Adventures of Frank Merriwell ran on NBC in 1934 as a 15 minute show and was sponsored by Dr. West's Toothpaste. The series also ran from 1946-1949 as a 30 minute Saturday morning show on NBC. Broadcast from New York, the new series starred Lawson Zerbe as Frank, with Hal Studer as his pal Bart Hodge and Jean Gillespie (soon replaced by Elaine Rost) as his girlfriend, Inza Burridge. These entertaining wholesome adventures are sure to make for delightful radio listening. Now let's hear The Adventures of Frank Merriwell !